Raith Rovers slipped out of the top four for the first time this season following a hard fought goalless draw against 10-man Hibs at Stark's Park this afternoon. In normal circumstances, such a result against the big-spending title favourites would probably go down as a point gained, but the 37th minute red card to Hibs midfielder Marvin Bartley put more emphasis on the two points dropped, particularly as results elsewhere meant Rovers dropped to fifth. The inability to capitalise on the extra man was certainly a disappointment - the Kirkcaldy side failed to create a single chance of note in the second half - but a first clean sheet in eight games was a big plus, especially the performance of stand-in captain Kyle Benedictus, who showed why he has been given the armband in the absence of Jason Thomson with a colossal display in the heart of the back four. 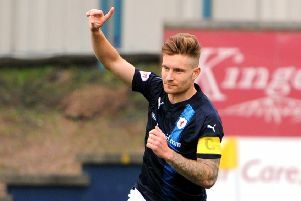 Raith boss Gary Locke felt that the sending off changed the game - for both teams. "They got plenty bodies behind the ball and hit us on the counter attack, and we found it really difficult to break them down," he said. "Hibs defended really well, as did we, so a point was a fair result." With the ex-Hearts connection at Raith, and both teams in need of points after poor runs, there was plenty spike in the game, and this boiled over shortly before the break as Hibs were reduced to 10 men. Rovers winger Bobby Barr fouled Marvin Bartley, who seemingly retaliated with a swipe of his leg, and referee Stephen Finnie brandished the red card, while a furious Barr had to be held back by his team mates. Before then, the match had been evenly contested, with few clear cut chances. Raith's best moments arrived in the early stages and on five minutes Jordan Thompson breezed through midfield into space 25 yards out but his well struck low shot was held by Ofir Marciano. On 11 minutes Raith had another go from distance as Barr drifted inside from the left wing and unleashed a powerful right foot shot that had Marciano at full stretch but the effort was just too high. It had been a positive start for the hosts, but they couldn't maintain it. A superb goal-saving challenge from Jean-Yves M'voto was required as Hibs threatened for the first time on 15 minutes. After losing the flight of the ball to allow Grant Holt to chest it down in the box, the French defender recovered superbly to block his point-blank shot. From the corner, an unmarked Paul Hanlon sent a glancing header onto the top of the crossbar - a lucky escape for the hosts. After a slow start Hibs were starting to motor and on 26 minutes, Fraser Fyvie sidestepped Kevin McHattie 22 yards out and angled a low effort across goal towards the far corner which drifted narrowly wide. Benedictus then made three vital clearing headers in quick succession as Hibs sent dangerous balls into the box, but there was no marking on Hanlon from a corner on 31 minutes as the centre-half headed just wide at the back post. The game's flashpoint arrived in the 38th minute as Bartley saw red - a decision which Hibs boss Neil Lennon plans to appeal against - and Raith dominated the ball until the break without threatening the Hibs goal. Rovers fans would have hoped their side could exploit the extra man after the break but they did not produce enough quality in possession to hurt the away side. Indeed, the Easter Road men were much more impressive with 10 men than they had been with 11. There was a loud penalty claim on 47 minutes from the Hibs fans behind the goal as Holt and Iain Davidson, the fourth different Rovers right back this season, wrestled each other to the ground but referee Finnie was unmoved. Only a superb defensive header from McHattie denied the visitors on 55 minutes as he managed to get his body between two inrushing attackers to bravely head clear from underneath his own crossbar. Form the corner, Rovers countered against an out-numbered Hibs defence but Declan McManus picked the wrong pass and Holt intercepted - a typical example of the sloppy final ball that hindered Raith's second half performance. On 64 minutes Ross Callachan hit the deck in the Hibs box only to receive a yellow card for diving after appearing to make the most of contact after taking a heavy touch. Three minutes later, Davidson was caught in possession allowing James Keatings to send over a dangerous cross that Holt just failed to connect with six yards out. Despite both teams opting for fresh legs in attack, the game finished with defences on top and neither goalkeeper being called on to make a save. There was a set piece chance for Raith in the final minute as Barr - the only player who looked capable of hurting Hibs in the second half - won a free-kick 30 yards out but with all the big men up from the back, substitute Lewis Vaughan ballooned his cross into the South Stand. If Raith are to stake a claim for promotion this season, they cannot afford to be so wasteful in the final third. With only six points between first and sixth, it is all to play for as the Championship season moves into the second quarter. Raith Rovers: Cuthbert, McHattie, Callachan, M'voto, Benedictus, Barr, Matthews, Davidson, Skacel (Vaughan 65), McManus (Stewart 71), Thompson (Johnston 87). Not used: Brennan, Coustrain, Roberts. Yellow cards: McManus, Thompson, Matthews, Callachan, Benedictus. Hibernian: Marciano, Gray, Hanlon, Bartley, McGinn, Fyvie, Holt (Graham 82), Stevenson, Keatings (Boyle 82), McGregor, Cummings. Not used: Laidlaw, Shinnie, Forster, Eardley, Harris.